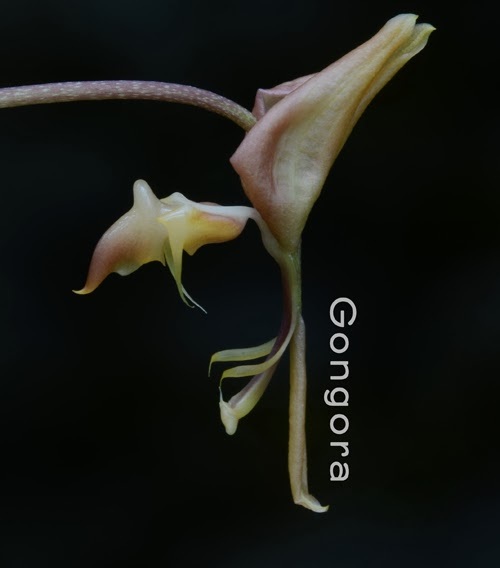 Gongora is a genus of tropical American orchids pollinated by fragrance-collecting euglossine bees. Gongora flowers are pedant on long inflorescences. In most (but not all) Gongora species, the pedicels are turned so that the flowers face the central axis of the inflorescence. Gongora aromatica has a spicy floral fragrance. Gongora gratulabunda smells like allspice and nutmeg. 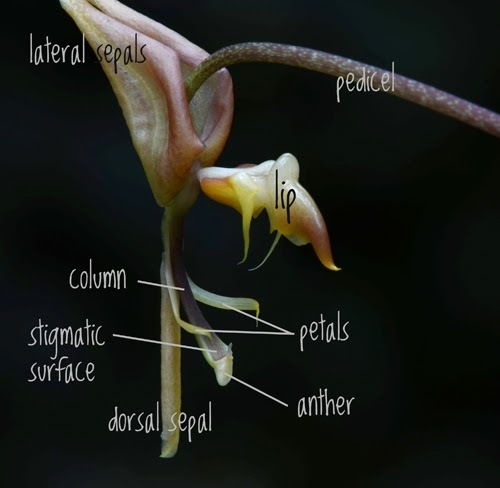 The lip, the Gongora's largest petal, is positioned above the column. The other two petals are attached to the sides of the column like small wings, forming a chute. When the bee lands on top of the lip, he begins searching for fragrance. He then crawls to the source of the fragrance on the underside where he scratches to collect the liquid fragrance. In order to transfer the fragrance to his hind legs, the bee releases his hold on the lip. He then slides down the column back end first, and through the chute formed by petals and column. At the end of the column, the bee first passes the concave stigmatic surface and then the anther cap. On his first trip to the Gongora flower, the bee picks up the pollinarium. At a subsequent flower the pollinia are deposited on the sticky stigmatic surface, thus achieving pollination. 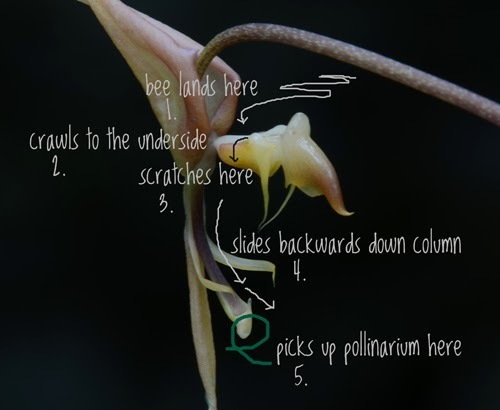 Orchid flowers employing this kind of mechanism to achieve pollination are called 'fall-through' flowers. Stanhopea is another example. These flowers are fantastic!